tussle over the state congress to elect the national delegates for the presidential primary. The delegates are to be elected to participate in the national congress leading to the election of the party’s presidential candidate for the 2019 general election. The battle was fiercer in Irepodun/Ifelodun Local Government, where Fayose and Aluko hail from, as the party members, including a serving member of the House of Assembly representing constituency 1 of the council, Hon. Posi Omodara, ward councilors and elected party officials rejected the choice of a former Minister of Aviation, Mr. Babatunde Omotoba, as a national delegate. However, members loyal to Fayose from all the 11 wards, who were also opposed to Aluko, boycotted the congress. 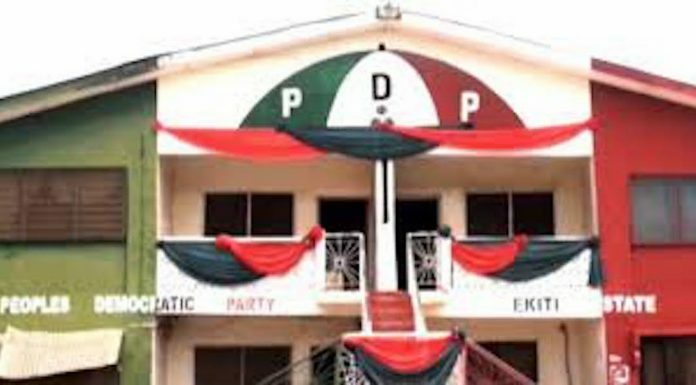 The PDP members at the congress conducted at the local government headquarters in Igede Ekiti, elected Aluko with 80 votes out of the accredited 84 delegates in defiance to Fayose’s preference for Omotoba. Most of the party members, who spoke at the congress conducted by party’s Vice-Chairman in Ekiti Central and Returning Officer, Mr. Tunji Kayode, said Aluko’s election as a national delegate was meant to save the party from undue slavery and for political emancipation. Addressing the party members, Aluko promised that he would continue to serve the party in the most committed way by the election he described as fight for political liberty and freedom. “The boycott by those rooting for the former minister of aviation didn’t vitiate the process. About 126 persons are to participate in this local government and 84 turned up out of which I polled 80 votes to emerge as a national delegate in this council. “Aside from that, the police, men of the Department of State Services and officials of the Independent National Electoral Commission (INEC) were present to monitor the election. There was no underhand tactics and my victory represented the wish of the party members. “I promise that I won’t betray the confidence reposed in me. I will continue to fight for the party’s cause and fight for its advancement all the times,” Aluko promised. The Returning Officer in the council Tunji Kayode after conducting the election said: “Our party had been damaged and we are praying that God should restore our lost glory. So we are not going to act in any way that would infract on the party’s constitution. A former PDP chairman in the council, Hon. Jinadu Isiaka, said the election of Aluko was targeted at saving the party from ruin occasioned by alleged imposition in the party. “What our people wanted is liberation and we are fighting for it in the interest of our party. We have seen that somebody was trying to impose a certain individual and we have revolted against that through our votes. “Some people have been piloting the affairs of this party in Ekiti and this council for long, but they were sidelined by certain authority, so time has come to fight for our liberty. “In democracy, majority is in control but this case was different. How can the minority be controlling the majority? This is not possible. We won’t allow anyone to impose in the PDP because that may lead to total collapse of our party and that we won’t allow to happen,” he said.